The SkyTrak all-wheel steer telehandlers are hard-working machines. Up to 16 inches of ground clearance provides excellent maneuverability over rough terrain. Featuring load-sensing hydraulics, a rigid box steel frame, and joystick controls, these telehandlers are built for productivity and mobility. Max lift capacity 8000 lbs. Max. Reach from Front Tires to 24 in. 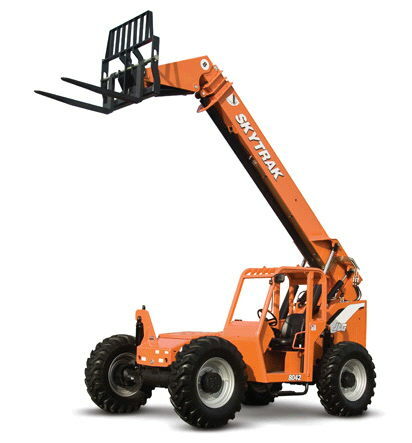 Load Center: 26'8"
Max reach below grade: 3'8"
* Please call us for any questions on our telehandler 8042 42 foot yard lift rentals in Durango CO, LaPlata County, Mancos, Ignacio, Cortez, Bayfield, Pagosa Springs, and Silverton CO.